Update - special Bonfire Night dinner now on sale (link at the bottom) for Tuesday 5th November. Perfect for seeing all the fireworks going off around London! 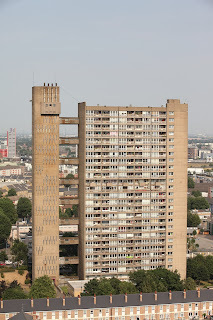 Grub London, who always organise dinners in unusual and architecturally interesting settings, are hosting six dinners to 20 people each night, at Balfron Tower, the Grade II listed Erno Goldfinger structure in Docklands. Dinners take place on Thursday - Saturday between 31st October and 9th November. "Over two weekends, 31st October–2nd November and 7th– 9th November, dine in style at the top of a brutalist icon. Housing association, Poplar HARCA has invited GrubLondon to a top floor apartment of Balfron Tower, East London, to provide six intimate dining experiences. Guests will receive a champagne & canapé reception on the roof, followed by five courses all whilst watching the combined firework displays of London. The set menu, inspired by the advent of winter, will draw upon classic British flavours and reflect the character of the space. All Grub locations are chosen carefully by head chef, Matt Klose and creative director, Sam Cooper who aim to provide a unique experience with a personal and relaxed atmosphere. Previous nights have included the Ben Oakley Gallery in Greenwich, an abandoned park keeper's lodge in Hackney Downs and the banks of Regents Canal. Terence Conran, Designer, and previous Grub guest said 'the venue was very charming, loved the wine we drank and the food was fantastic… a brilliant evening'."